At its core, the Tesla Coil is an electrically resonant system capable of generating extremely high voltages. 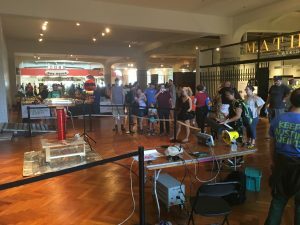 Originally developed by Nikola Tesla in a failed effort to build a wireless power distribution network, the Tesla Coil now primarily serves as an object of entertainment and education. It can dazzle audiences with spectacular displays of plasma, play music, and wirelessly turn on fluorescent lights from many feet away. As with many naturally occurring resonant systems, the Tesla Coil is built from multiple energy storage elements that pass energy between themselves in a cyclical manner. It is analogous to more familiar mechanically resonant systems such as a pendulum or bell. To illustrate, imagine a pendulum swinging back and forth. At the pendulum’s highest point, its gravitational potential energy is at its peak and the kinetic energy is zero. 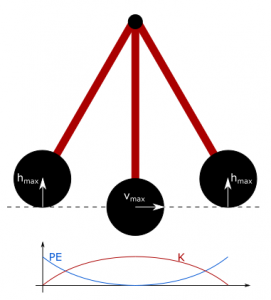 The pendulum’s potential energy is then gradually converted into kinetic energy as it swings to its lowest position. As it swings past this point, the process is reversed, converting kinetic energy back into gravitational potential until it halts at the top of the path. The whole motion is repeated, forming a cycle of motion and energy transfer. And if one would like to raise the maximum height or speed of the pendulum, a push at the right moment can add energy to the system causing the desired effect. Where a pendulum passes energy between momentum and gravitational potential, a Tesla Coil passes energy between a magnetic field and an electric field. The tall coil forms a large inductor that produces a strong magnetic field when a current passes through it, and the torus on top is a conductive surface that forms a capacitor with the ground, producing an electric field as charge is deposited on it. The inductor’s current deposits charges on the torus, transferring energy from the magnetic field to the electric field. Once that transfer is complete, the process is reversed by the deposited charges attempting to return to ground potential through the inductor. Their flow causes a magnetic field to form in the inductor in the opposite direction until there is no net charge on the torus. The magnetic field then continues to pump electric charges out of the torus, causing an electric field in the opposite direction to build while again depleting the magnetic field, This process is repeated in a cyclical manner, only diminishing from resistive losses. Like with the pendulum, energy can be added to the system each cycle with a synchronized “push” in the form of an alternating voltage source until finally the electric field becomes so strong it rips the electrons from air molecules in a brilliant flash of plasma. 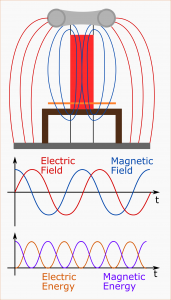 Modern “solid-state” Tesla Coils are typically built from two magnetically coupled resonant circuits and driven by a power electronic converter called a voltage-source inverter. The two resonant circuits each have a coil to store magnetic energy and a capacitance to store electric energy. But while the circuit featuring the flat coil uses a capacitor bank to store electric energy, the other, larger coil uses its torus and the ground to store electric energy. The two coils are then configured so they share a central axis, and by extension, magnetic fields. This allows for energy to be magnetically transferred from one circuit to the other, forming a power transformer. The inverter applies an alternating voltage at the system’s resonant frequency to the “primary” circuit (the flat spiral coil), which in turn produces a voltage in the “secondary” circuit (the tall coil) because of their magnetic coupling. Each cycle, the voltage source pumps more energy into the system causing the currents and voltages in each element to grow until finally the voltage at the torus breaks down the air in a brilliant flash. 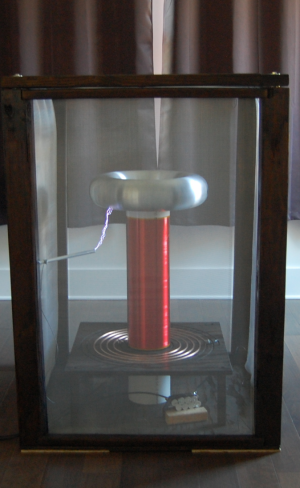 There are at least two methods by which a Tesla Coil can reproduce sound. The most straightforward method is to take advantage of the “pop” produced when an arc initially streaks through the air. This sound can be repeated to produce a buzzing sound and at a high enough repetition rate (or frequency) human ears begin to perceive this as a crude tone. Thus, by simply repeatedly enabling and disabling the entire system, a tone can be produced. The other method is to allow a continuous stream of plasma to flow from the torus and slightly modulate its current by modulating the driving voltage source. 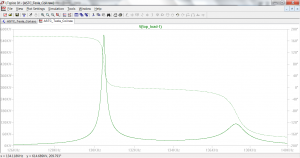 This is an example of amplitude modulation that is achieved through pulse-width modulation. While it is conceptually much more complicated, it reproduces sound in a way that is comparable to a low quality speaker. Tesla Coils pose several risks to observers and nearby electronics that can all be mitigated through relatively simple means. 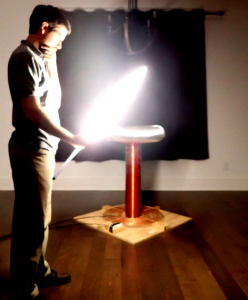 First is the Tesla Coil itself, which intentionally produces high voltages on several exposed conductive surfaces. 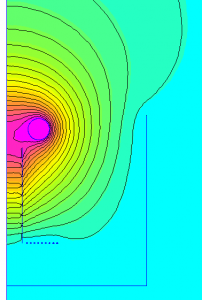 The electric field between those surfaces can interfere with electronics and induce currents in nearby conductive objects. It can also arc to close enough objects or observers, causing damage or burns. The easiest way to mitigate this is to place the coil a safe distance from any potential risks either through the use of barriers or by elevating the coil on a platform. 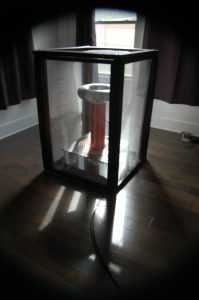 Another technique is to place the coil within a grounded conductive cage, containing the electric field within the cage and preventing observers from getting too close. Another risk is posed by the driving electronics. While it is no more dangerous than any other power supply or appliance running on a standard wall outlet, care must be taken to restrict access with a good enclosure and to ensure it is properly grounded to prevent electrical shock. And finally, there are electrical components within the system which have the potential for failure, posing a mild fire hazard, namely the switching transistors and the capacitors in the inverter and primary circuit. Good electrical and thermal design can ensure a long life and safe operation for these components, and safe packaging and well designed protection can limit their failure to a barely noticeable event. Tesla Coils electrically interact with their environment making their performance vary with the room geometry and humidity. Thoughtful placement of the coil or controlling the environment with structures like Faraday Cages and ground planes can make the results reliable. Below are specs for a coil designed for the 2018 ASTC conference, though, a system can be designed for practically any setting. Look for this project at the following events in the summer of 2018. If you are interested in having this Telsa Coil as part of your event or would like to inquire about a custom built system, feel free to contact me.